Gabe Scelta of testing firm OpenSignal is out on the road measuring the 3G and 4G services of America's major wireless networks in cities throughout the U.S. as part of PCWorld/TechHive's annual wireless data speed tests. We will publish the results of the study here on TechHive in late May. My mission roaming the country checking carrier strength so far has taken me to six large metropolitan areas. I love cities for all they have to offer, and for the purpose of broad data collection they are the most useful; after all, 79% of all people in the US now live in a major metropolitan area. * But for me, some of the more interesting data is found in the outliers. With the majority of us living in cities, we tend to forget that there are places that are still off the grid. As Simon Andersson mentioned in his recent post (Africa’s Mobile Explosion, February 2013) Africa’s previously under-developed land-based telecom network has paved the way for mobile phones to be ‘the basis for development, rather than its result.’ From a planning perspective, rural areas in the US are not particularly different. Areas with under developed land-based connectivity have a lot to gain from mobile network availability. Like broadband availability, mobile connectivity is going to be a major factor in the opportunities afforded to those living and working in geographically outlying areas. Several separate studies have shown that high speed broadband in rural counties led to statistically significant growth in total employment, wages and number of new businesses (for details take a look at Measuring Broadband’s Economic Impact and Broadband Internet’s Value for Rural America). It’s likely that high-speed mobile data connectivity is going to follow the same trend. However, before the economic opportunities can follow, rural areas first need service. 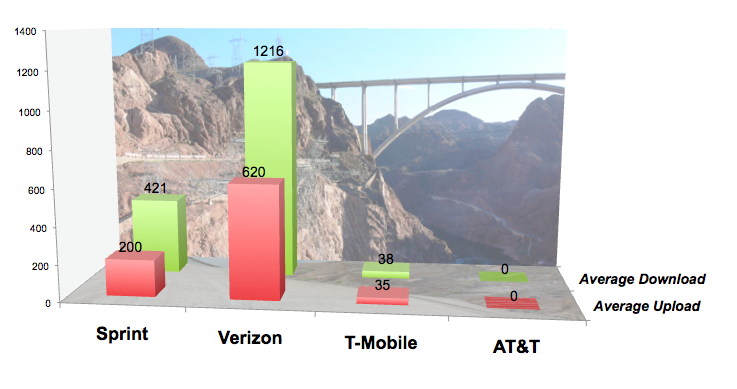 The above graph is showing average connection speeds in kbps at the Hoover Dam, which straddles the Colorado River in Clark County, Nevada and Mohave County, Arizona. Just for fun, I ran some speed tests at the Hoover Dam on my way from Las Vegas to Phoenix. The rough terrain and relative lack of population means that this is quite the outlier. While I’m sure the power plant has land-based connectivity, for an average tourist with a phone the situation is highly variable. For someone in an emergency the best bet is a text message to someone with a better connection. As you can see, if you are with AT&T you are up the Colorado River without a paddle. (This confirms @paulkbiba‘s informal test, which he posted about on my TechHive post). The wireless carrier’s decision to cover a particular area (or not) is usually based on a simple cost benefit analysis. Essentially, the denser the user population, the more likely it is that a carrier can recover their installation and maintenance costs and still make a profit. In this area, the majority of users are just passing through, either on vacation or like me, driving elsewhere, leaving the local communities, dam workers, and emergency services in the dust. I know first hand that access to the Internet provides substantially increased economic opportunities. As a tech-inclined high school student in Stanfordville, NY (current pop. 2,246), I could not get online fast enough–and at the time we were talking a dial-up modem with Prodigy. It’s humbling to realize that in the absence of that singular connectivity, slow as it was, I would not have had 95% of the opportunities that I did, including the biggest kickstarter of income elevators, a college education. Looking forward, I see 3G mobile service as the dialup of the future. There are kids growing up in rural areas of Nebraska and Nigeria alike who are going to get the chance at an education because of what they are reading about on Wikipedia right now. You can follow my travels on Facebook (OpenSignal Gabe), FourSquare (OpenSignal) where I’ll be checking in periodically. I’ll also be blogging some more about my epic road trip here on TechHive. This story, "Testing cell networks across America: The outlying areas matter, too" was originally published by TechHive.